We are currently witnessing the birth of smart wearable accessories. Smartwatches are slowly creeping up around us and will eventually be as common as the smartphones we use today. However, this interesting concept from 91mobiles gives us a glimpse into our near future - Meet the Google Nexus 360. This conceptual device shows us what are future can look like in the coming years, as technology evolves to meet our various needs. It takes on the tasks of the smartphone, while focussing on features like health and security. A phone that converts into a watch: use it as a conventional phone, or wear it as a wristband... with the full range of features available in both modes. 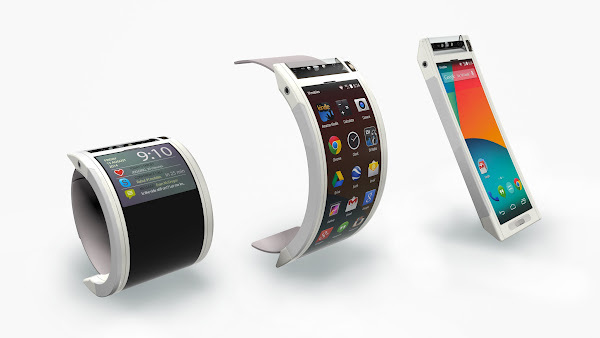 Flexible polymer OLED display: offers great usability and vibrant visuals. Embedded Bluetooth headset: can be docked on the side of the device, and draws power from it for charging. An integrated fingerprint scanner and heart rate monitor: take care of security, health monitoring and sleep tracking. Integrated sensors and apps capture related data. A tube camera that’s on your wrist: makes shooting easy, and allows snapping pics from different angles. The same high-resolution camera doubles up as primary camera, along with shooting selfies. Always-on e-ink display on the side: makes sure users don’t miss out on notifications. Designed for all-weather use: IP67-certified for resistance to the elements.